Just before the 2019 Polls… a Forecast! It is no news that Nigerians will head to the polls tomorrow, February 16, 2019, to vote in their candidates for the posts of president, vice president and federal representatives at the national assembly. The Independent National Electoral Commission (INEC) had earlier in January 2019 published the final voters register for the 2019 elections, ending with 84,004,084 voters, indicating a 25% growth from 2015 ( 67,422,00) in number of registered voters. The SS, NC and SW zones showed the largest gains in registered voter numbers. Registered voters data per INEC’s Voter Register. Average voter turnout down to 39% from 47% in 2015 and 57% in 2011. Historical voting pattern remains largely sustained except for few states with significant disruptive factors. Public sentiment, party campaigns and intuitive subjectivity. 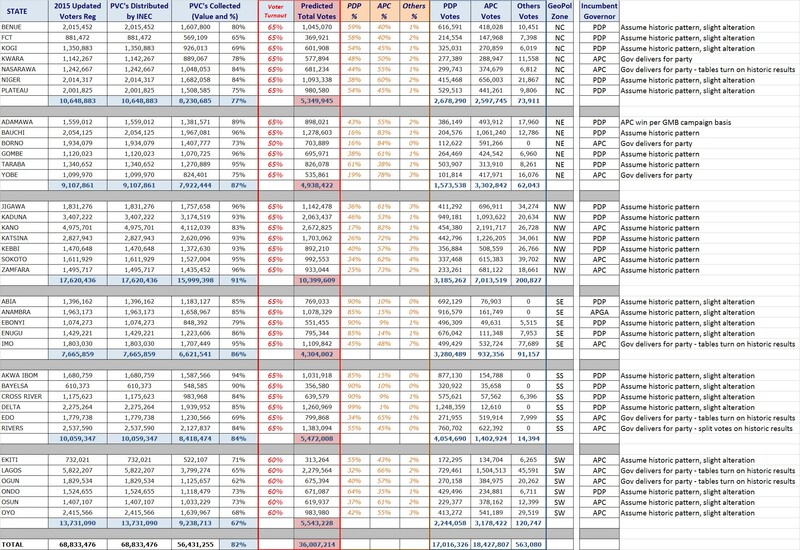 Forecast excludes invalid/cancelled votes which historically account for up to 7% of votes cast. This projection is by no means the final result and cannot be interpreted as such. Forecast Verdict: A majority victory for APC in the presidential elections with 16.3 million over PDP 14.8 million votes. Total win in 24 (of 37, including FCT) States with >25% win in 27 States. It was a day of joy and relief for the camp of the Nigerian Senate President, Dr. Bukola Saraki, on Wednesday June 14, as the Code of Conduct Tribunal (CCT) ruled in his favor, discharging and acquitting him of any charges. The office of the Attorney General (AG) of Nigeria had in September 2015, filed an 18-count charge against Saraki before the CCT, accusing him of false and anticipatory declaration of assets and operating foreign bank accounts as a public servant. The Code of Conduct Bureau is empowered by the CCB Act to “establish and maintain a high standard of morality in the conduct of government business and to ensure that the actions and behavior of public officers conform to the highest standards of public morality and accountability”. The functions of the CCB include “receiving, examining and taking custody” of asset declarations by Nigerian public officials. As such, where there are issues around asset declaration by public officials, the CCB is empowered accordingly and the AG’s office was not out of line in filing this case. All Progressives Congress (APC) is the ruling political party in Nigeria, having won the 2015 elections, putting an end to 16 years of Peoples Democratic Party (PDP) at the helm of affairs. The Senate President, Bukola Saraki, is a card-carrying member of the APC. An APC led government filed a corruption case against a top APC official, within 4 months of assuming power. In September 2015, there was no Attorney General of the Federation as President Buhari was yet to appoint cabinet members. Ministers (including the current Attorney General and Minister of Justice, Abubakar Malami) were officially appointed/assigned in November 2015, six long months after the President assumed office. The initial 13-count charge filed from the office of the Attorney General was prepared by the Deputy Director, M.S Hassan. Saraki declared assets worth N10 billion to the CCB when elected executive Governor of Kwara State in 2003. His assets then included cash, real estate and stocks. He also declared his assets to the CCB in 2007 and 2011. Why on earth will an APC led Federal Government file a criminal case against one of its high-ranking office holders, barely 4 months into their tenure? Typically, would this not have been treated as a “family affair” as is common with internal party squabbles? What was different? Why did the office of the Attorney General (suddenly) decide in 2015 to revisit asset declarations that were done between 2003 and 2011, about 4 to 12 years after the fact? There is no publicly known query to the asset declarations done by Saraki in 2003, 2007, 2011. What was different about 2015 that triggered dusting up old papers? Recall that Saraki became President of the 8th Senate in June 2015, after being voted in unanimously by 57 senators, in the absence of most APC senators. Nigerians will vividly remember the political drama that ensued that day. 51 APC senators had left the chambers of the National Assembly to attend a truce meeting allegedly set up by the party leadership at the International Conference Center, Abuja. The party preferred candidate at the time was Senator Ahmed Lawan representing Yobe South district. It was easy to conclude that Saraki might have played Maradona on his party leaders! Was this the trigger? Who instructed the DD, CCB to file charges? Was it an action item from years of review and investigation or was there external political influence? Did Saraki falsely declare assets before he got them? Did he operate foreign bank accounts while serving the nation? We know from the ruling of the Supreme Court that there was no proven truth beyond reasonable doubt. Regardless, what are the unproven truths? For example, what is the truth about when Saraki acquired the Ikoyi property (No. 15A & B, Macdonald road)? Were they bought in 2000 as declared or in 2006 when sold by the Implementation Committee on FG landed property? As has become the norm with several occurrences within the Nigerian political sphere, we are witnessing another story with a beginning but without a definite end. For Saraki, it ended with the CCB’s ruling and acquittal. For Nigerians, it’s probably not so. How is it possible for the nation’s foremost anti-corruption agency (in the public service) to end up with a ‘no case’ ruling? Was it deliberately sabotaged? The Federal Government was represented in court by Senior Advocates of Nigeria but they ended up with ‘no case’. Surely there is more to this than meets the eye. Our questions will continue to linger, rumors and theories will loiter the political space, and one common saying will unfortunately prevail… the more you look, the less you see! Why Are Nigerians Like This? The Nigerian Experience. We’ve all attempted, at some point in our colorful lives, to fully define what this phrase means to each of us, how it shapes our decision making, how it defines our perception and reaction to everyday situations, and above all, how it uniquely qualifies our experience in this dear parchment of land we call home. That’s all I’ve done here really. Now, walk with me through a few of those moments that make you exclaim every now and then “Why are Nigerians like this?”. Imagine driving your car on a cool Sunday evening (best day to drive around Lagos really), negotiating a roundabout somewhere in the metropolis… don’t be caught thinking that vehicles approaching will give way to traffic at the roundabout. They rarely will. It’s left to you to know when to stop, inch forward, stop, jerk forward, give way and then move ahead. At other times you’re driving behind a commercial bus or taxi on the highway… you’re a good and smart driver so you maintain a safe distance… a bus stop is just a few seconds ahead of you. To your utmost shock, the commercial vehicle driver does not ease off the highway into the bus lane… he stops right there in front of your car, while you watch the conductor jump out, hollering at potential commuters. You make the mistake of honking as expected… the conductor throws you a glance that implies to you that you must be crazy for expecting them to pull over in the bus lane … which is actually the right thing! Ah! The other very typical scenario… it’s a hot afternoon and you’re just trying to drive down for lunch. You have been tailing this car for a few minutes and notice the driver starts to slow down and his indicator comes on, telling you he’s about to make a left turn. So, likewise, you hit the brakes and slow down, to allow him make his turn before you move on. But wait… the car behind you will have none of that… as far as that dude is concerned, you are slow and daft… no be so we dey drive for here, he thinks. So yea, he swerves out to your right and overtakes you and the left turning vehicle… not forgetting to give you that “Yo! You stupid?” look. The worst part? He’s probably a chauffeur and his ‘oga’ is seated behind giving him thumbs up because oga is late for a business meeting with a bank MD! If doing it right will take longer, do not wait! Who waiting ‘epp? Swerve your way till you get ‘there’! The end justifies the means! It’s Thursday night and Ade just got off work super stressed. So he choose to drive to the cinema to see a movie… something cool and calm… he really just wanted to relax. He gets to the mall and the car park is filled to the brim, so he drives out to park outside by some company building. Ade is barely done parking and some guy in a security uniform walks up to his side, taps on the window… “oga, no parking here sir”! Ade opens the door, attempting to alight and then asks him what the issue is. He replies “no parking here sir. It’s not allowed”. But you see… Ade is a ‘sharp guy’ and so he smiles and looks the security guard straight in the eye, and with a mastery of Pidgin English, he says “cool dahn! I go sort you!” The guard retreats while grinning ear to ear… then wait for it… he salutes Ade! Money first… every other thing follows! Jude misplaced his debit card and needed to do some urgent transactions. So he hopped out at lunch time aiming to dash in and out of the bank. After all, all he needed was a replacement debit card. To his surprise, he met a queue, some sitting, others standing, waiting in turn to be attended to by two customer service personnel who did not look excited about life in any way. Jude joins the queue. After about ten minutes of waiting, he notices a sleek range rover drive up close to the bank entrance, a young man steps out, clad in his sparkling white fitted traditional attire, his leather slippers all shiny brown, sunglasses on ‘fleek’, and wrist chains flashing in the bright sun. He walks in, approaches the customer service section, sweeps his gaze across the line of customers waiting and then beckons to the bank staff. One immediately stands up to greet him “welcome sir, please come this way sir”. Jude almost fainted. He had been there all these minutes, yet this ‘big boy walks in and gets premium service, not needing to join the queue! It’s another Monday morning and Fola just got to work. She’s still tired from the weekend but the bills have to be paid. So she parks her car at the office designated spot, does a brief ‘facebeat’ session, picks her bags and walks into the office building, hoping to avoid any trouble makers or work horses. She barely takes a seat at her desk when one of those office madams (who must always talk) stops in front of her. “How was the night?” she asks! Fola smiles in return but says nothing… but madam won’t stop. “You look stressed. Didn’t you sleep well?” Not waiting for a response, she continues “You need to take it easy o! All you these single girls… always attending parties abi… you better go and marry!” At that moment, Fola’s manager calls her phone. She was too glad to take the call. Every now and then, there’s the warm, welcoming Nigerian nature that meets you from the least expected, like having a road traffic officer assist you when your car breaks down in the middle of the highway, without asking for a dime! Or the occasional driver that stops at a zebra crossing for you and other pedestrians to walk across! It’s all part of the Nigerian experience. What are your experiences? A President on leave: AWOL or ALLOWED ? It’s no longer news that Nigeria’s President, Muhammadu Buhari, left the shores of the country on January 19, 2017, to commence a 10 day vacation in the United Kingdom. There is nothing wrong with this as the President is entitled to annual vacation. The 2008 Public Service Rules specify a 30 day annual vacation for the highest grade level. These rules apply to the President as far as there is no inconsistency with the constitution. As is expected, President Buhari wrote the National Assembly, following due diligence, to hand over power to the Vice President in his absence. During his 10 days off, he planned to ‘undergo routine medical check ups’… almost typical of the average upper middle class Nigerian… leveraging their vacation abroad to conduct health checks. No prizes for guessing why this happens. He was due to resume February 6, 2017. On the eve of the tenth day of his leave, the President communicated again to the National Assembly, extending his vacation “in order to complete and receive the results of a series of tests recommended by his doctors”. He did not specify how long this extension would last. Again, nothing particularly wrong here. Due process was followed and his vacation duration has not exceeded the annual allowance. Let’s work this backward a little bit. To resume on Monday February 6, after 10 working days off-work, means the first day of vacation should be Monday January 23. His letter to the National Assembly also corroborates this. However, what was the effective start date of his 10 day vacation? When did he transmit to the National Assembly? January 19. Has he issued a written declaration to the contrary? No. So may we infer that according to law, the President’s functions were transferred to the Vice President on January 19, hence his vacation commenced same day and by same inference, his original vacation duration was 12 working days and not 10 days as widely publicized? Did our incorruptible President tell an inadvertent lie? The interesting thing is that this is not the first time Nigeria is being thrown into a moment of uncertainty regarding the whereabouts and state of the President. In the early hours of January 15, 1966, Nigeria’s Prime Minister, was abducted from his residence by coup plotters and led away to an unknown destination. For 5 days, no one knew the state or location of the Prime Minister. Within this period, the coup attempt had fallen through with Major General Aguiyi-Ironsi taking over leadership after some form of ‘agreement’ with the Council of Ministers, so there really was no lacuna at the top administratively… but the whereabouts of the Prime Minister remained uncertain. Unfortunately, he was discovered dead in some bush along the Lagos – Abeokuta road. Similarly, in July of the same year, Nigeria witnessed the infamous 1966 counter coup. The plotters arrested the then Head of State, and led him away similar to the January occurrence. Several days after, the state and location of the Head of State was unknown, despite the fact that a semblance of leadership had assumed the seat of power. You may argue again that there was no real vacuum in leadership but there was uncertainty about the erstwhile leader. Fast forward to November 2009 when the serving President was flown out of country urgently for medical treatment. This case is peculiar as it presented both public uncertainty and a lacuna in leadership. For over 2 months, his status was shrouded in some form of secrecy leaving Nigeria to drift in stormy waters like a rudderless ship. His omission to formally write the National Assembly and transfer the duties of leadership left Nigeria in the hands of a corrupt and treasury looting cabal. Unfortunately, it took his death for uncertainty to give way. With the eventual intervention of the Nigeria Bar Association, Supreme Court and the Senate’s ‘doctrine of necessity’, power was transferred to the Vice President in a bid to set the nation on the right path. Today, there are still similarities. With the President transferring power legally to his Vice, he commendably averted a leadership void. However, there are quite a few uncertainties. What is the true status of our President, beyond being ‘hale and hearty’? Besides being located at Abuja house in London, where is his true location? Is he more in the hospital, taking pictures only at convenient moments or are those just rumors and imaginations? Did he request and announce a 10 day vacation when it was actually 12 working days? Is he entitled to 30 calendar days or 30 working days of leave or an unlimited duration? 30 calendar days was exhausted February 19. 30 working days will be exhausted March 1. So.. is this really ‘annual leave’ or ‘sick leave’? How long is a serving President allowed to be away from duties before we are forced to ask whether he remains capable of resuming work to discharge his duties? The clock is ticking, the opposition is raging, the world is watching. Will the political class join hands to intervene (like the doctrine of necessity) or insist on strict observance to extant laws regulating how long a public servant can be away from work? Time will tell and history may just be the best guide to answering these questions. The Nigerian Dilemma – Keeping it Simple! It is no longer news that Nigeria is currently in an economic dilemma. So much has been written and discussed, yet, the person on the street still wonders what the problems, and more importantly, the solutions are. This post provides a simplified summary of the economic issues affecting Nigeria, and offers some near and long term solutions to improve the state of the economy. Nigeria is an exporter of crude oil and produced an average of 2.1 million barrels per day in 2015. Nigeria’s oil (Bonny Light for example) sold for about $98/barrel (January 2014), $48/barrel (January 2015) and $33/barrel (January 2016). In January 2014, Nigeria had an earning potential of $205.8m per day from selling 2.1mbpd of crude at $98/barrel. That potential, by estimate, dropped to $100.8m per day in January 2015, and $69.3m per day in January 2016(2.1mbpd, $33/barrel). Nigeria exports a number of things (crude oil being the main item) but is also significantly dependent on imports for industrial use and local consumption. Local businesses that require foreign exchange (dollars) to buy imported equipment, building materials, automobiles, fabrics and food products are currently in trouble. Why? Foreign exchange is not readily available to them, and where available, it is sold at a premium, as high as N390 to a dollar recently. Nigeria’s current monthly dollar demand is said to be approximately 3.5bn if media reports are to be believed. Compare that with an estimated monthly oil export earning of ~$2bn (2.1mbpd, 30 days, $33/barrel). Demand obviously exceeds supply and the rate on the dollar goes all the way up. In 2 years, Nigeria has lost ~65% (about $25bn average annual loss) of its foreign exchange revenue potential due to falling crude prices. In other words, the amount of dollars available to run the economy has dropped significantly. Recall that crude oil sale accounts for about 95% of our foreign exchange earnings. In the 3rd quarter of 2015, PMS accounted for 44% of our imports, the highest single import item. Similarly, PMS was 39% and 35% of imports in 1Q and 2Q 2015 respectively. Obviously, petroleum products dominate our import bill. What have we spent the bulk of our foreign exchange revenue on? PMS imports! What is draining our earned dollars? PMS imports! One of CBN’s initial responses involved drawing down on our foreign reserves to sustain the import bill. This resulted in a steady decline of foreign reserves — currently down to about $27.8bn. Consequently, other measures were put in place to manage demand for the dollar. One of these was the exclusion of importers of 38 goods from accessing dollars from the Nigerian foreign exchange market. The goods (rice, cement, poultry, etc.) were however not banned from being imported! The sale of (our few available) dollars is now targeted at local producers at the official rate, N199.5: $1, to stimulate local production (Buy Naija, Grow the Naira). All others who need dollars are left with no option than to buy from the parallel market at whatever rate meets the day. CBN also halted the regular sale of foreign exchange to the parallel market (Bureau de Change), leaving ‘black market’ vendors to source the dollar by alternative means. The result? Further scarcity, leading to exchange rates as high as N400 to a dollar. This has created an unhealthy spread between the official and parallel market: N199.5 versus N390+ to a dollar. If a Nigerian business man gets $4,000 at the official rate, is there not sufficient incentive to simply sell off at the parallel market and make an instant gain of at least N760,000 without engaging in any value-adding activity? Obviously, Nigeria needs to increase foreign exchange revenue to be able to sustain her economy and reverse these early signs of a declining trade surplus. How can we grow forex earnings though? Diversify our export base and focus on other locally produced, non-oil items. Focus on agro-products like cocoa where Nigeria already has some leverage. The International Cocoa Organization estimated that Africa will lead global cocoa exports in 2015, with Nigeria being 4th largest producer in Africa, 9th in the World (2015 estimates). More so, in April 2012, at the Conservation Alliance, agriculture experts predicted Nigeria will be the largest global producer of cocoa within 10 years. Wishful thinking? Or worth government policy focus backed by private sector funding? According to the NBS’ Foreign Trade Statistics Report, apart from oil and gas, cocoa was Nigeria’s highest foreign exchange earner in Q3 2015. Some State Governors (Abia, Adamawa, Akwa Ibom, Cross River, Delta, Edo, Ekiti, Kogi, Kwara, Ogun, Ondo, Osun, Oyo and Taraba) need to evolve action plans to achieve quick wins here and spend less time engaging in boisterous political tirades in the media. Other items that earned Nigeria significant foreign exchange in Q3 2015 are rubber, cigarettes, aluminum alloys and leather. According to the Rubber Research Institute of Nigeria, rubber is produced in Abia, Akwa Ibom, Anambra, Bayelsa, Cross River, Delta, Edo. Rivers, Ondo, Ogun, Taraba, Oyo, Ebonyi, Enugu, Osun, Ekiti, and Kaduna. What are these States doing to increase capacity? Growing capacity in these areas will not only diversify our export base in the medium term, it will also increase employment in the agriculture and manufacturing sectors. Government policies must lean in this direction, to attract and encourage private sector funding. States Governors should evolve action plans to achieve quick wins and spend less time engaging in boisterous political tirades in the media. The other significant option is glaring. Develop an action to stop importing PMS. What have we spent the bulk of our foreign exchange revenue on? PMS imports. Grow in-country capacity to refine crude into petroleum products and watch the dollar burden on imports drop significantly. Our 4 refineries have continued to perform subpar in spite of repeated turnaround efforts. Capacity utilization in 2015 was dismal. These refineries need to be commercialized and then privatized to restore business efficiency. While this is in process, an emergency cause needs to be invoked to fast-track the construction new refineries to support local demand for PMS (realistically about 25 million liters per day, excluding border smuggling) and export to neighboring countries. Licenses were granted in 2015 for the construction of 65 modular refineries. What is the progress status on these? Dead on arrival? The current management of the NNPC has done an admirable job in promoting and actualizing PMS price modulation in spite of the President’s leanings. This already encourages private refineries to build, produce and sell profitably. Oh but guess what? They will require substantial forex to support fast-tracked construction. The refinery modules will be imported! These options will however require time to actualize and may not be any immediate benefits. What is most critical is the assurance that our leaders are crystal clear on the issues and publicly committed (in word and deed) on a dogged resolution plan…. 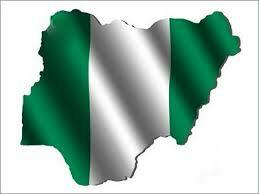 Grow Nigeria, Save Nigeria! It is evident that corporate/formal jobs may end up tailoring your career to fit a particular path without fully exploiting your innate abilities. The truth though is that the capitalist world we live in was strictly designed to employ resources to maximize profit for the owners…. nothing more. While people get all buried in work with grandiose desires to rise to the top, they need to realize that their skills and capabilities are only utilized while they fulfil their organizational goals of profit maximization. For example, a foreman at a construction firm who is also a skilled saxophonist is not likely to be able to use his musical skill to enhance his company’s profit. This always holds true except in a rare case in which his music is used to boost the productivity of his peers. Similarly, a basketball enthusiast who works as a bank manager will not use his sport skill to enhance the bank’s bottom-line except perhaps at the State or National Banker’s Games where a win may boost the bank’s brand. After a while, the basketballer’s mind becomes filled with thoughts of what could have been- “Ah! I used to play basketball a lot”. He watches helplessly as the rat race takes over at the detriment of all his inbuilt skills, talents and capabilities. While he might enjoy tremendous career success and rapid promotion, somewhere in him lies untapped and unexpressed potential. This is the dilemma which many young people find themselves in today. They work at full time jobs that offer considerable career growth and pay the bills to the detriment of the expression of their full potential. What other options of self-expression are available to people considering the demanding nature of their regular jobs? The most common option is for such is to take advantage of annual vacation. Let me ask – How do you spend your vacation? Or hol’ up! Do you even take vacation? The few days or weeks away from work offer an excellent opportunity to work on your other skills and capabilities. The saxophonist may want to spend days rehearsing with an ad hoc band or even play with an existing band. This might provide him an opportunity to meet others who share his musical interests. Many interesting collaborations have been birthed at “strange” places. The basketballer may find herself providing coaching assistance to young ones at a stadium or nearby sports facility. One can only wonder how many sports academies are ‘locked up’ in the hearts of many corporate executives whose lives only revolve around their formal job. What happens to those who rarely get time off work all year round? While it is not healthy for individuals to work without sufficient rest, the reality suggests that this is not uncommon. After some time, diminishing returns set in, morale wanes and such an individual ends up in the coping zone. What to do? Consider maximizing public/bank holidays and weekends. A typical example is that of a medical doctor who is IT savvy but whose time is taken up at the hospital attending to patients while preparing for career examinations by the side. There are quite a lot of routine processes within hospitals that are in dire need of automation. As a subject matter expert, the doctor is in the best position to solve such problems. Any spare time could be used by the doctor to build applications that would help optimize medical processes and make work easier. As with most ventures, the most important part is taking the first step. Generally, one should focus on using every free time to hone skills that are not necessarily used on your job. The options listed are by no means exhaustive. We must consciously ensure that we are living our lives to the fullest, using all our capabilities to positively impact our world. A wise man once noted “The graveyard is the richest place on the surface of the earth because there you will see the books that were not published, ideas that were not harnessed, songs that were not sung, and drama pieces that were never acted”. Maximize your capabilities and be all you can be! October 1st is a day for joy and celebrations for us Nigerians, whatever the circumstances we find ourselves in because it is the day, 55 years ago; we liberated ourselves from the shackles of colonialism and began our long march to nationhood and to greatness. Nonetheless, that we have remained together is an achievement we should all appreciate and try to consolidate. We have witnessed this year a change in our democratic development. The fact that an opposition party replaced an entrenched government in a free and fair election is indicative of the deeper roots of our democratic system. Whatever one’s views are, Nigerians must thank former President Jonathan for not digging-in in the face of defeat and thereby saving the country untold consequences. My countrymen and women, every new government inherits problems. Ours was no different. But what Nigerians want are solutions, quick solutions not a recitation of problems inherited. Accordingly, after consultations with the Vice President, senior party leaders and other senior stakeholders, I quickly got down to work on the immediate, medium-term and long-term problems which we must solve if we are to maintain the confidence which Nigerians so generously bestowed on us in the March elections and since then. As you know, I toured the neighbouring countries, marshalled a coalition of armed forces of the five nations to confront and defeat Boko Haram. I met also the G-7 leaders and other friendly presidents in an effort to build an international coalition against Boko Haram. Our gallant armed forces under new leadership have taken the battle to the insurgents, and severely weakened their logistical and infrastructural capabilities. Boko Haram are being scattered and are on the run. That they are resorting to shameless attacks on soft targets such as I.D.P. camps is indicative of their cowardice and desperation. I have instructed security and local authorities to tighten vigilance in vulnerable places. In the meantime, improvement in the power supply is moderately encouraging. By the same token, supply of petrol and kerosene to the public has improved throughout the country. All the early signs are that within months the whole country would begin to feel a change for the better. Preliminary steps have been taken to sanitize NNPC and improve its operations so that the inefficiency and corruption could be reduced to a minimum. Those of our refineries which can be serviced and brought back into partial production would be enabled to resume operations so that the whole sordid business of exporting crude and importing finished products in dubious transactions could be stopped. In addition to NNPC, I have ordered a complete audit of our other revenue generating agencies mainly CBN, FIRS, Customs, NCC, for better service delivery to the nation. Prudent house-keeping is needed now more than ever in view of the sharp decline in world market oil prices. It is a challenge we have to face squarely. But what counts is not so much what accrues but how we manage our resources. At an early stage, the federal government addressed the issue of salary arrears in many states, a situation capable of degenerating into social unrest. The APC government stepped in to provide short-term support to the debtor states and enabled them to pay off the backlog and restore the livelihood of millions of Nigerians. I would like to end my address this morning on our agenda for CHANGE. Change does not just happen. You and I and all of us must appreciate that we all have our part to play if we want to bring change about. We must change our lawless habits, our attitude to public office and public trust. We must change our unruly behaviour in schools, hospitals, market places, motor parks, on the roads, in homes and offices. To bring about change, we must change ourselves by being law-abiding citizens. We live in a time where information is readily available to help both businesses and individuals plan and make good decisions. Yet, in 2015, Nigeria still struggles with primary data and statistics to enable proper national planning. Almost 3 decades since oil was first discovered, the opacity within the industry is appalling. Nobody seems to know how much oil is produced per day at each wellhead, the volume of oil stocked at each refinery on a daily basis or the inventory is held at the refineries hold on a going basis. It is not surprising that a popular joke around suggests the Nigeria National Petroleum Corporation (NNPC) does not even know how many bank accounts it operates! How Much Petrol Do We Consume? In its November 2011 report on “The real cost of subsidy and tax implications, PWC estimated our daily consumption as 32 million liters. According to Punch in October 2012, demand was 40.32 million liters per day. The Journal of Petroleum and Gas Engineering in November 2013 puts this figure at 30 million liters per day. In the same month, November 2013, an online news platform, published national daily consumption as 39.66 million liters, quoting the immediate past Minister of Petroleum. September 2014, another online news platform reported daily consumption as 40 million liters per day. February 2015, The Nigerian Guardian reported same national metric as 40 million liters per day. This is probably why the current public impression is somewhere between 30 and 40 million liters per day. What is the basis for these figures? Is there any clear statistical method to support this? If we are unable to accurately estimate daily demand, how do we know what quantity of petrol to import? It seems Nigeria does not know how much petrol it consumes, but like our former President once said, maybe America will know… or perchance the Nigerian Bureau of Statistics might help. In May 2015, the NBS initiated plans to conduct a survey on domestic supply and demand for petroleum products. Hopefully, when this survey is completed, we will have clarity on how much petrol Nigeria consumes. While we anticipate, let’s see whether the NNPC can help a bit. A review of 2014 product distribution data shows that 4,375.7 million liters of PMS were distributed across the 36 States and Federal Capital Territory by the NNPC, Major marketers and Independent Marketers. “Disclaimer: Product distribution data was not received from majors like Forte Oil, MRS Etc. at the time of the report”. 544.2 million liters of Household Kerosene (HHK) and 416. 3 million liters of Automotive Gas Oil (AGO) were distributed nationwide through the year. This puts the average monthly distribution for 2014 at 364.6 million, 45.3 million and 34.6 million liters of PMS, HHK and AGO respectively. 2014 daily distribution extracted from same data yields 12.2 million, 1.5 million and 1.2 million liters of PMS, HHK and AGO respectively. In 2014, the FCT, Delta and Lagos States received the largest volume supplies of PMS from NNPC distribution. 2014 volumes distributed by Independent and Major Marketers are not broken down by State. 2015 daily distribution (January through March) as extracted was 12.6 million, 1.0 million and 0.6 million liters of PMS, HHK and AGO respectively. A consistent trend observed from the NNPC reports is the average daily distribution of PMS. From 2014 through 2015 March, the data shows an average of 12.3 million liters of PMS distributed for consumption per day. If we double this to cater for disclaimers (non-available data from some oil majors) and unknowns, it results in a worst case estimate in the range of 25 million liters of PMS per day. This raises some important questions around the difference in consumption. Does Nigeria consume 25 million liters per day or 40 million liters? How much of this is consumed locally and what percentage is smuggled to neighboring countries where petrol sells for at least N140 per liter? In a period where fuel subsidy costs exceed our capital expenditure, it is important to understand how much wastage can be cut from budgets. For this to happen, the NBS needs to be properly funded to undertake the necessary research and data gathering needed to capture local information and aid national planning. Nigeria’s 2015 presidential elections are due to hold in a couple of days, barring any last minute changes to the rescheduled date, March 28. The poll was initially scheduled for February 14 but deferred due to ‘security concerns’, as stated by the Independent National Electoral Commission (INEC). The postponement was not a welcome development to the All Progressives Congress (APC), the country’s strongest opposition political party, considering the massive momentum and traction gathered ahead of the planned February 14 date. The ruling Peoples Democratic Party (PDP) on the other hand appeared to be in sync with the decision to reschedule. Popular public opinion holds that if the elections had been held as initially planned, the APC would have come out victorious, perhaps inching towards a landslide. This impression was further alluded to by the likes of Dr. Frederick Fasehun, leader of the Oodua People’s Congress (OPC), in a speech delivered at a post-national conference forum on March 20. The six weeks of postponement have afforded the ruling party a little more time to ramp up its campaign efforts, with a reported unrestricted flow of cash incentives to party loyalists and the public at large in a bid to secure sufficient votes to return the incumbent president, Dr. Goodluck Jonathan, to power. Public impression was that APC momentum had burned out, its campaign funds exhausted, to the extent that even campaign jingles via traditional media were few and far between compared with the PDP’s which appeared to have been heightened. Town hall meetings also became a major channel employed by both parties, reaching out to multiple voting segments. Several conspiracy theories characterized the six week waiting period, chief of which was the alleged plan of the PDP to ensure that Prof Jega, the electoral body chairman, was removed from office via terminal leave on or before March 28. Three days to the elections, Prof Jega still remains the INEC chairman. Likewise, there was the war against the use of PVC’s and card readers, considering that INEC only decided to run a public sample test post February 14. The tenacity and commitment of INEC and its stakeholders met this opposition effectively, restoring public confidence in the use of PVC’s and Card readers as part of anti-electoral fraud initiatives. INEC continued to progress distribution of PVC’s to eligible voters and to date has recorded an approximate 82% PVC collection rate. This assumes that out of 68.8 million registered voters per 2015 Voters Register, 56.4 million have received their permanent voter cards. With the 6 week waiting period almost exhausted, it is natural to expect to see a shift in focus from conspiracy theories to election result forecasting on several bases and assumptions. Leveraging data from INEC’s Voter Register per geopolitical zone, assuming historic voting patterns adjusted to reflect current political sway, an average of 65% voter turnout in each State, admitting the influence of incumbent governors on their states, ongoing public response to party campaigns, and intuitive subjectivity, the table below presents an individual forecast of what may be expected. It is by no means the final result and cannot be so interpreted. Rather, it is a prediction anticipating several cross comparisons. This forecast predicts a majority victory for the APC in the presidential elections with 18.4 million over PDP 17.0 million votes.